The Fastest Straightening Iron Ever. The OnePass Iron represents a true break-through in straightening iron technology. The OnePass allows users to straighten hair in half the time compared to traditional irons. This is the professional's #1 choice in irons. With patented silicone speed strips in the plates, it allows users to straighten and style hair in half the time. BioCeramic heaters heat up OnePass to 400 Degrees Fahrenheit with instant recovery for smooth results, roots to ends. OnePass Iron plates emit natural negative ions and far infrared energy that break down water clusters on the hair surface into smaller molecules that penetrate deeper, hydrating hair, removing frizzies, and creating healthy-looking, shiny hair. 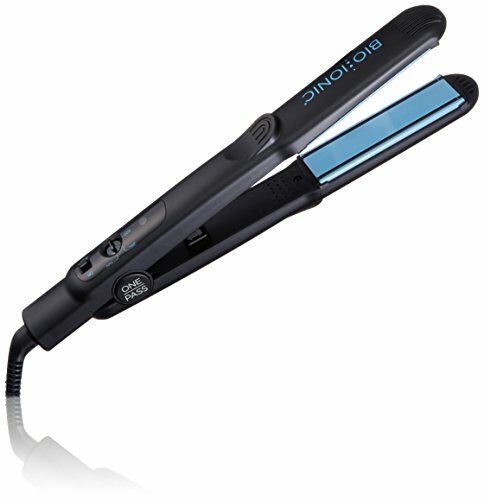 It's Multi-level heat controller, and 9 ft Swivel Cord make it one the most preferred irons chosen by stylists.